Rounds out its portfolio with integrations, transcription, room systems upgrades, and AR support. From augmented reality (AR) to transcription and beyond, cloud video provider Zoom has introduced a series of enhancements aimed at increasing the value of its services to its growing enterprise customer base. Zoom shared the news today at Zoomtopia, the company's first users conference. These enhancements deliver on the company's vision to make video collaboration as frictionless as possible, Oded Gal, head of product management, told me in a pre-briefing. 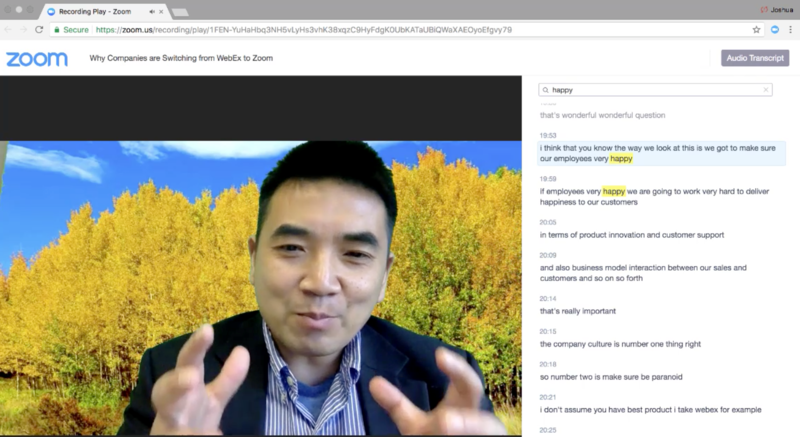 To start, Zoom unveiled Meeting Transcripts, which delivers transcribed video recordings. Meeting Transcripts convert speech from a recording into text, identifying the speaker of each word as well. This, in turn, makes the video recording searchable; users can search the transcript for keywords and speakers and jump to those mentions for playback. Video transcription can provide value in a number of use cases, such as sales trainings, Gal said. "In situations like sales calls, it lets users go back and analyze how conversations went, see what worked, what kind of terms were used, and so on." Meeting Transcripts is initially available only by request, but Zoom said it will eventually make the capability open to all with no upgrade required. Another big part of Zoom's news today are new and enhanced cloud integrations -- namely, with Slack and Workplace by Facebook. While Zoom has had a Slack integration for several years, it has now optimized integration support using Slack's new API, which provides a better interface for people to click to join meetings, Gal said. Additionally, Zoom now sends a report to the originating Slack channel or chat once the meeting ends. And, if the meeting was recorded, it sends a link of the recording to the channel, too. 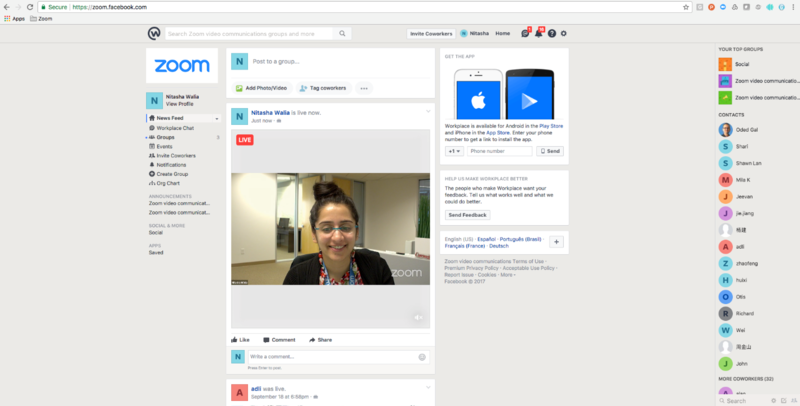 The Workplace by Facebook integration allows users to launch Zoom video meetings from within the Workplace dashboard. It adds to Zoom's Facebook Live integration, which allows users to stream to public Facebook, Gal said. These integrations come at the request of Zoom customers who increasingly have demands for Zoom to integrate with more and more tools, Gal said. Beyond that, cloud integrations give the company an opportunity to show that it works well with others -- "seamlessly in a way that allows you to escalate from chat to meeting, in any tool." A third bit of news coming out of the user conference, taking place in San Mateo, Calif., is around Zoom Rooms, the company's conference room platform. "We're making Zoom Rooms into more of a platform, supporting not only the conferencing itself but also extending to other spaces," Gal said. Zoom announced its scheduling tool earlier this year, along with a display that goes outside of each room that lets you fire up a Zoom meeting automatically upon entering that room. Now you can loop in additional signage and other displays to the Zoom ecosystem -- screens in a lobby or cafeteria, for example, to stream the CEO's all-hands address during lunch hours. "What we are trying to do is make solutions available from large enterprises to medium and small companies," Gal said. "We try to democratize the communications space by providing a cloud solution that leverages commodity hardware and make it applicable to any-sized company." Finally, Zoom developed an integration with AR provider Meta, which lets people share and manipulate 3D models as holograms in real time on the Zoom platform. The goal is to open up spatial learning so Zoom users can build 3D architecture models or immerse themselves in a new product design via photorealistic holograms, the company said. This suite of improvements announced today are all part of making meetings "easy to use, easy to access, and accessible to multiple spaces," Gal said. "That generates the frictionless experience we are aiming for."